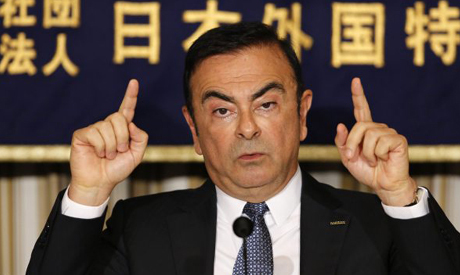 Carlos Ghosn, the French-Lebanese chief of Nissan-Renault, on Thursday shrugged off any chance of vying for the Middle Eastern nation's presidency, saying he has "too many jobs already". The 60-year-old, widely credited with saving a near-bankrupt Nissan more than a decade ago, was born to Lebanese parents in Brazil. "I've been accused of accumulating too many jobs already. So unfortunately, I don't think this is part of the probabilities," he told reporters in response to a question about a political run, after delivering a speech at the Foreign Correspondents' Club of Japan. "I think I have a job to do as head of two large companies," he added. Speculation over a political career was fuelled by reports last year quoting Ghosn as saying he would rely on the same techniques for running Lebanon that he used to turn around Nissan. The Lebanese parliament is divided between two main camps, the pro-Syrian regime bloc led by Hezbollah and backed by Damascus and Tehran and a second bloc led by the son of assassinated former prime minister Rafiq Hariri and backed by Saudi Arabia and Washington. The two sides are divided over the war in Syria and the question of Hezbollah's weapons, and have failed to agree on a candidate to fill the presidency. Ghosn spent most of his childhood in Lebanon where he attended French schools and is a graduate of France's elite Ecole Polytechnique. He took over at Nissan in 1999, dispatched by Renault after the French firm took a controlling interest in the Japanese carmaker that was then on the brink of bankruptcy. Nicknamed "Le Cost Killer", Ghosn embarked on aggressive expense-cutting programmes to rescue the firm's battered balance sheet. His unlikely bid made something of a folk hero in Japan, where is he one of only a few foreigners to lead a major firm.